Home » Library » Knowledge Base » Families » Marriage » What are the legalities of getting married in church? What are the requirements for civil registration of Christian religious marriage? 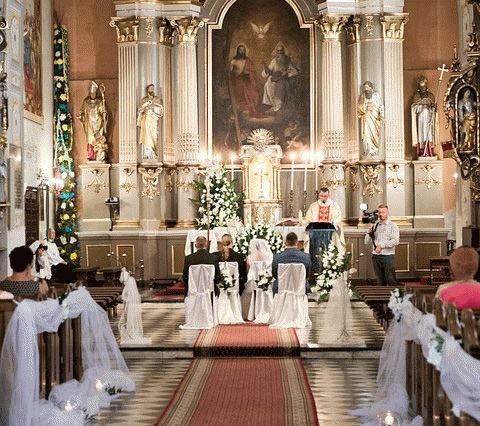 What are the legalities of getting married in church? What are the requirements for civil registration of Christian religious marriage? If you wish to marry in a church in Malaysia, you should first arrange to see the person in charge of marriages at the building to discuss your plans, give formal notice of your marriage and book a wedding ceremony at the venue. Normally few months advance booking is required. Inter-faith marriage is acceptable in Malaysia but different churches have different responses to such marriage. One of you must profess the religion of the church. The church may also require that you be a regular worshiper and reside within the boundary of the church. You are required to attend a marriage preparation course. A marriage preparation course is a series of few sessions designed to help couples enhance their ability to communicate, resolve conflicts among themselves and strengthen their relationships. Upon successful completion of the course, you will be presented with a certificate. If you are getting married in a Catholic church, you need to make an appointment with the Priest to complete a Pre-Nuptial Enquiry form. The main purpose of the Pre-Nuptial Enquiry is to enable the Priest to ensure that you freely consent to the marriage and have a good understanding of the duties and responsibilities of married life. If this civil element of the religious ceremony is omitted, the marriage is deemed invalid. You are required to obtain Form JPN.KC02 from the Registrar of Marriages or Church Wedding Coordinator. After filling the application form, you shall make a Statutory Declaration in Section D.1 of the form with a Commissioner for oaths or Magistrate declaring that all marriage requirements are being complied with and that there are no legal impediments to the marriage. You must then submit Form JPN.KC02 to the Church, along with the relevant supporting documents. Your banns of marriage will be published in the church and called on three Sundays before the day of your ceremony where civil registration will take place. This gives an opportunity for any objections to the marriage to be voiced. If you fail to turn up to register your marriage within 6 months after the date of submission, all proceedings consequent thereon shall be void and fresh application have to be submitted. You need to ensure the proper set up of tables, chairs and decor on the day of the event. You also have to organise your wedding flower arrangements and choose the sound, lighting, music, hymns, readings and a photographer. After that you need to write the order of service for reception or prepare the wedding booklet. Wedding rehearsals can be arranged. Speak to your Church Wedding Coordinator who will be pleased to help you. It's your big day! Relax and make your day as unforgettable as ever! The wedding ceremony commences with the singing of entrance hymn. This will be followed by the bridal processional, opening prayer, scripture readings, solemnisation of marriage , blessing of rings, exchange of vows and rings, lifting of the veil, prayer, nuptial blessing and post communion prayer. At the end of the ceremony, the solemniser , the couple and the two witnesses must all sign the marriage register. Please note that it is VERY IMPORTANT to check the entry in the marriage register to ensure the details are correct. It can be a complex process to make any correction in the marriage register after signing it. The completed marriage register must be filed with the Registrar of Marriages so that the marriage can be civilly registered. A Marriage Certificate will then be issued as the official document that you have undertaken a legal marriage ceremony. ^ Under Section 24 (3) of the Law Reform (Marriage and Divorce) Act 1976, the Assistant Registrar solemnising a marriage shall in some part of the ceremony remind the parties that either of them shall be incapable during the continuance of the marriage of contracting a valid marriage with any other person and if either of them shall marry during the continuance of the marriage he or she will commit an offence. Under Section 22 (5) of the Law Reform (Marriage and Divorce) Act 1976, every marriage shall be solemnised in the presence of at least two credible witnesses besides the Registrar. ^ If you have doubts about whether the priest whom you have chosen is a registered solemniser, please contact the Registrar of Marriages in your district. What is a void marriage? What is a voidable marriage? What are the differences? What are the marriage procedures in Malaysia? How to get married in Malaysia? At what age can you get married without parental consent in Malaysia? What is the minimum age for marriage in Malaysia? Does the Law Reform (Marriage and Divorce) Act 1976 apply to all Malaysian?